This will make 4 mini chocolate cream pies or one standard 9-inch pie. Make the Crust: Preheat oven to 350 degrees F. Combine the Oreo cookie crumbs and the melted butter in a medium bowl and combine with your hands (I wore plastic gloves) until the crumbs are evenly moistened. Press the crumbs evenly into the bottom and up the sides in each mini pie plate, forming a crust. Refrigerate the lined mini pie plates for about 20 minutes. Bake for 10-12 minutes, until the crust has set. Make the Chocolate Cream Filling: Using a stand mixer fitted with the whisk attachment, beat 8 ounces softened cream cheese, 1/2 cup sugar, 1/3 cup cocoa powder, 1/3 cup milk and 1 teaspoon vanilla extract until fluffy, for about 3 minutes. Spread in each cooled chocolate cookie mini crust. Refrigerate while making the whipped cream topping. Make the Whipped Cream Topping: When ready to serve, using a stand mixer fitted with the whisk attachment, beat the heavy cream and sugar in a chilled bowl at medium speed to soft peaks (about 2-3 minutes); add the vanilla. Continue to beat to barely stiff peaks (another minute or 2). 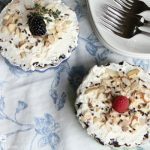 Spread the whipped cream over the chilled chocolate cream filling and garnish with the chocolate sprinkles and sliced almonds and top with a single raspberry or blackberry. Serve immediately.